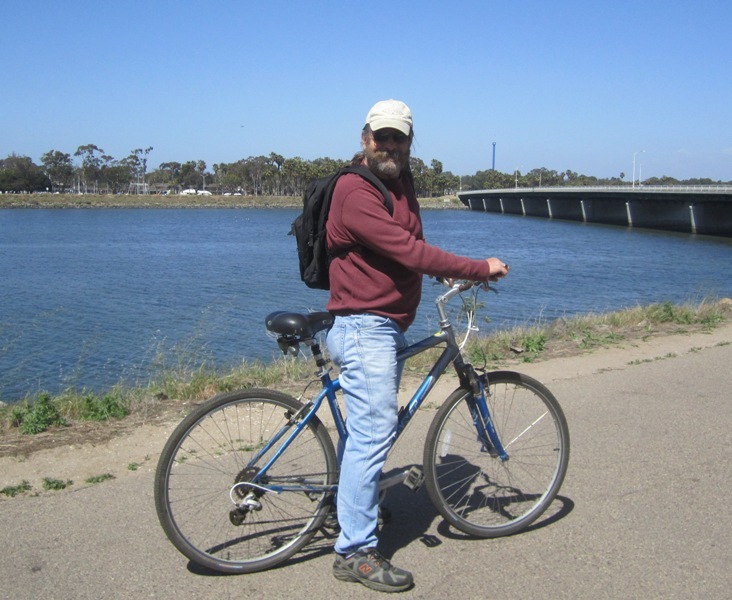 The tour I now present around Mission Bay is a great one and it is a ride that has been honed by me and a few riding friends over the last three decades – since the early Eighties. It is a ride along a route that has a minimum of traffic and street exposure, and it is a route that is practically 13 miles round trip from the Ocean Beach Skateboard Park in Robb Field. 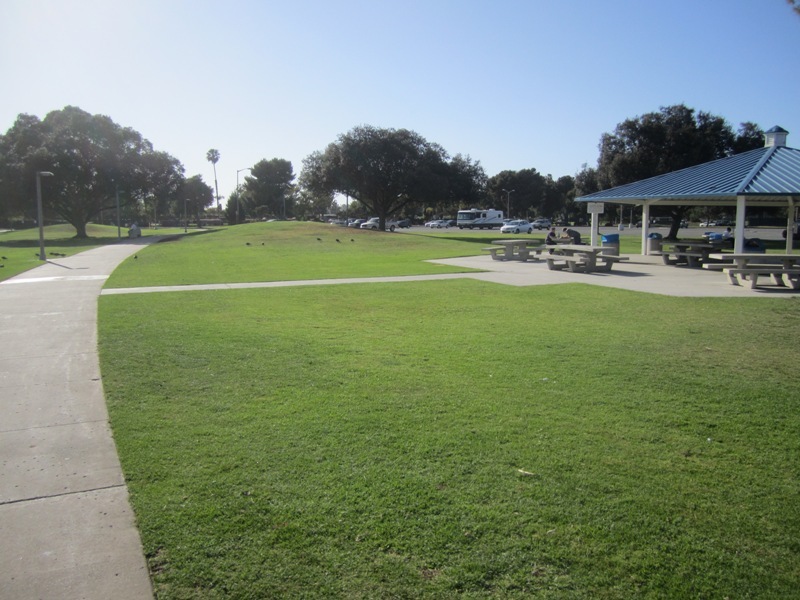 Starting out – looking east past the Skateboard Park towards Sunset Cliffs Blvd. This route normally takes me about an hour and three quarters to ride. Yet it took me two days to chronicle it and take all the photos. My photos have captured the best of Mission Bay, especially the myriad of human activity the surrounds and permeates the largest aquatic park on the West Coast. Why Mission Bay? Why Now? The wonders of wildlife along the route. 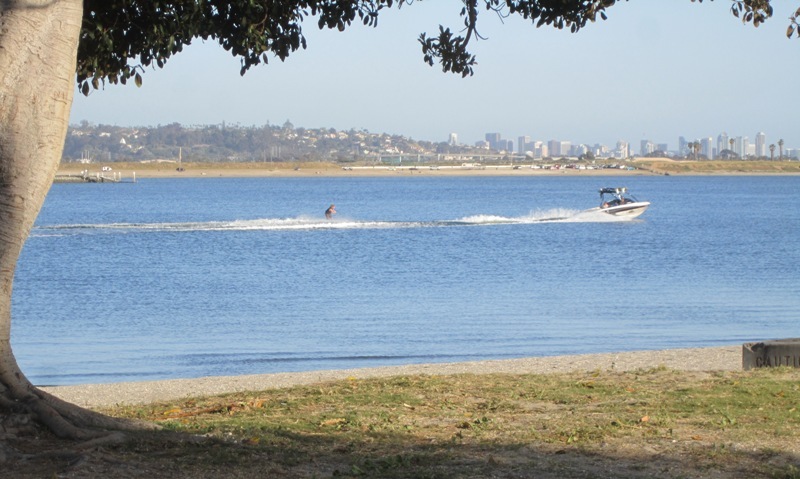 Yes, Mission Bay is the largest playground of any of the “re-stored” lagoons in California and elsewhere this side of the Rockies. It is a great public resource and still has enough attributes of nature and wildlife to make biking around it a most pleasurable experience. Why now? It’s spring, the flowers are blooming, the sun is – mostly – shining. It’s a great time to get out and get some exercise. And what better way to do that than to take advantage of this great water and shore-lands park at our fingertips. I have been biking around these waters since the early Eighties and as I lived in OB the vast majority of these past decades, the following route is indeed OB-centric – and it begins in Ocean Beach. This is from the Crown Point Park, looking east towards downtown San Diego. The route I recommend has, as I’ve mentioned, a minimum exposure to vehicles, traffic and streets. 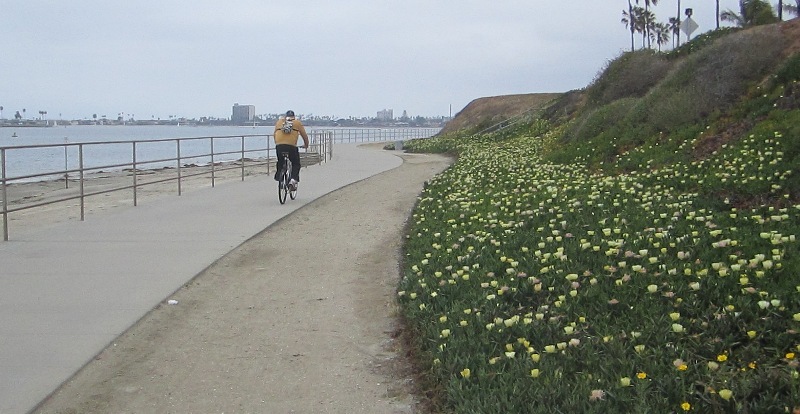 The route follows mostly bike and pedestrian paths, the San Diego River asphalt road, but there are a few spots where there are no real bike paths and the bicyclist must take to the roadway, yet even the streets that are traveled have minimum traffic themselves. 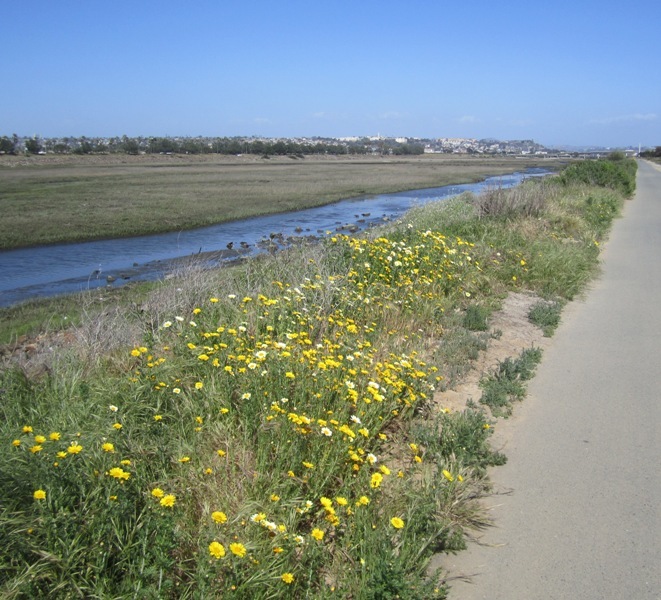 Bike and ped path just north of DeAnza Cove. The route favors bike paths over sidewalks, and sidewalks over streets and/or painted bike paths. And along the way, I will note alternative paths or interesting side trips. 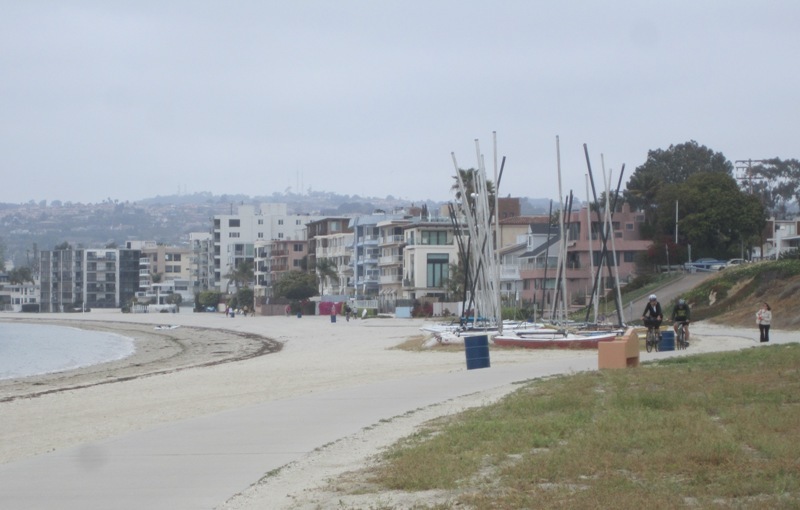 There are plenty of rest areas and restrooms along the route, and it does avoid high pedestrian areas – like the Mission Beach Boardwalk. Unfortunately, you are exposed to the noise and toxins of the freeway for acouple of miles, as you glide along the River and next to I-8. 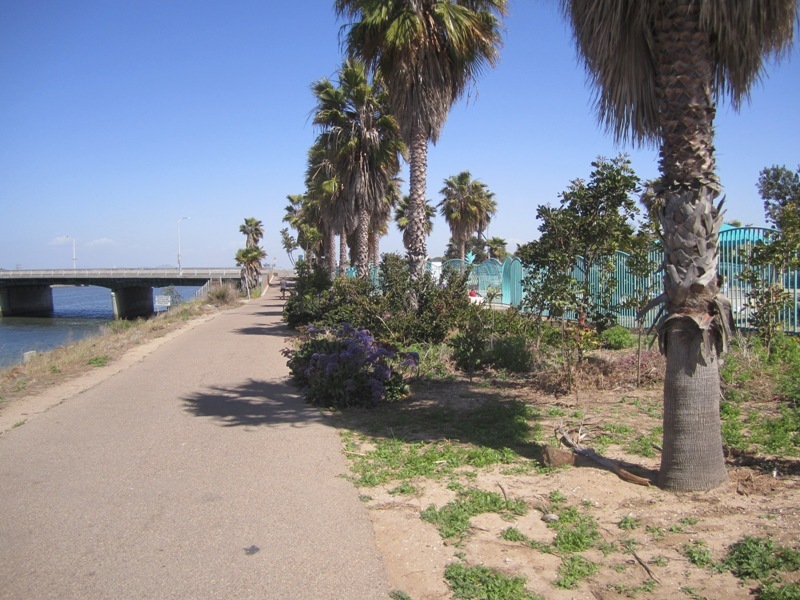 Looking east along the San Diego River – it used to be called the “flood control channel”. Some factors to consider: time of week – more pedestrians, joggers and bicyclists on the weekends, of course. Wind is a definite consideration, and it is because of the headwinds that I recommend heading east at first, so there are a minimum of winds on the return route back to Ocean Beach. The route takes off from the OB Skateboard Park at the terminus of I-8 and right next to the San Diego River and goes east (there’s usually plenty of parking in Robb Field). 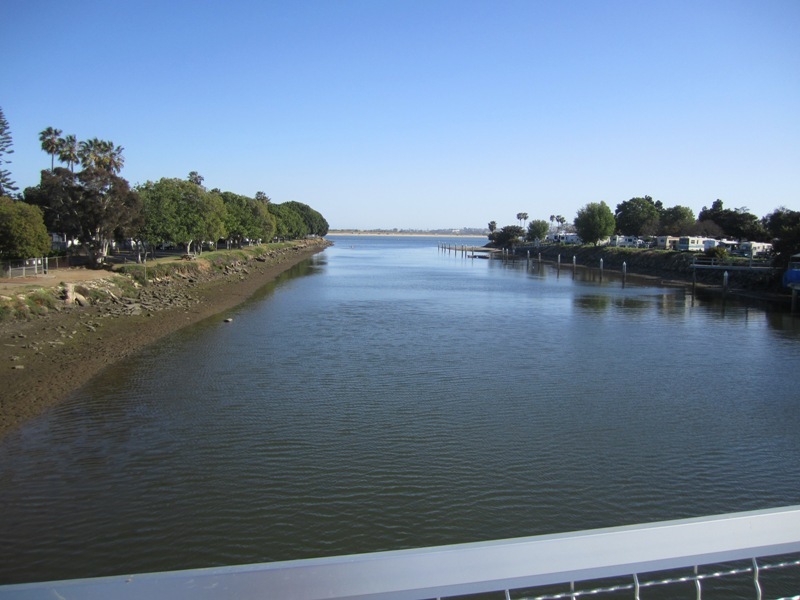 For 2+ it follows the River and then it jumps up to a short stretch of Pacific Highway, crosses the River and then dumps down onto the bike paths of East Mission Bay. Coming up to the intersection of 2 great freeways of California, the 5 and the 8. From there you travel north. If you can imagine Mission Bay as a giant 4-leaf clover, with the bottom 2 leafs squashed, then you are circulating the outer lines of those leafs. 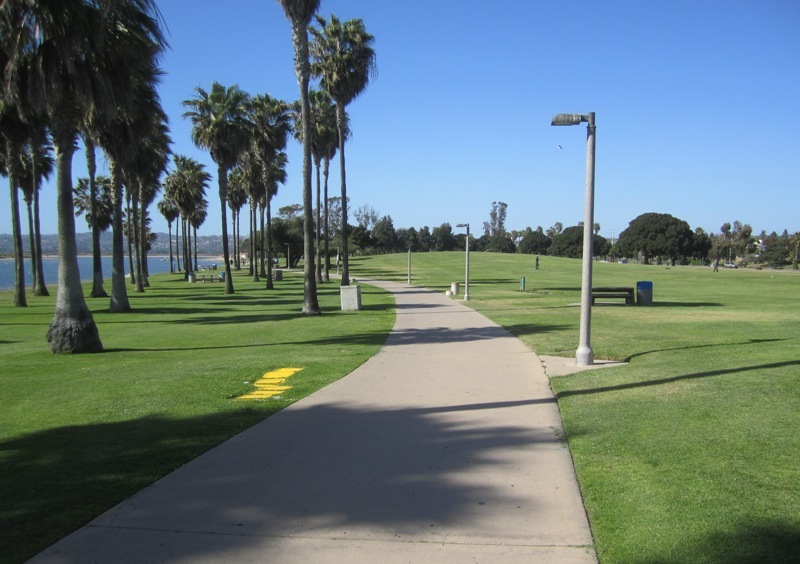 You pass Fiesta Island and ride along shady paths next to white sand and lush green lawns of the park. At the tip of the right top leaf, you enter DeAnza Cove, and then turn west, cross the new Mike Gotch pedestrian bridge over Rose Creek. At that point, you have to take to the streets around Crown Point, but you drop down to more parkland and travel over to the north-west quadrant of the clover. Peddling on the “inside” bike paths of Mission Bay, you hardly ever see a car. Finally, you head south and turn towards OB with the Mission Beach Roller Coaster off to your right and rear. You complete the circle by crossing the San Diego River once again and turn right towards the Skate Board Park and the end of the trip. 2. Go east down the San Diego River. With the Pacific at your back, head east down the San Diego River on the south side of the water and tidelands. After about 2 plus miles, you wind up at the intersection of the two great freeways, the 8 and the 5. 3. Bike under I-5 and take ramp up to Pacific Highway. You tuck under I-5 and an on-ramp, and then take the bike ramp up to Pacific Highway. Once on the bridge, take a left. The Great San Diego River, taken from the Pacific Hwy bridge, looking east. 4. Head north towards Mission Bay on Pacific Highway, by crossing San Diego’s largest river, taking in views that you don’t often have of the largest waterway in the County, pass by the CHP station, cross the bridge over I-5, and come down to Sea World Drive. This is probably the most dangerous section of the route as the bike path fades away on the bridge over the freeway. 5. 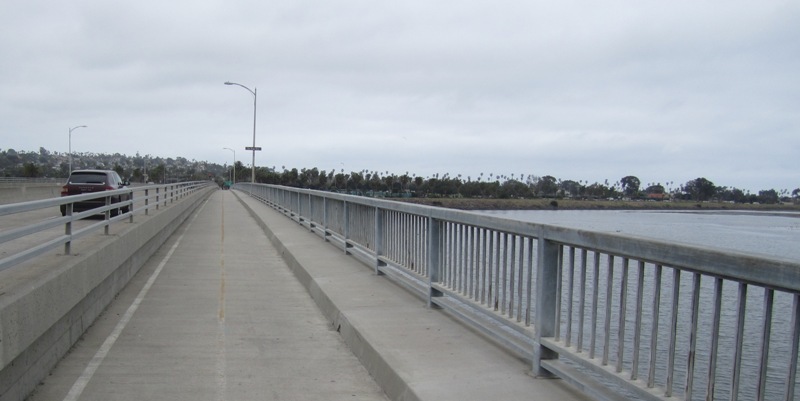 Travel through the intersection of Pacific Highway and Sea World Drive, go straight – west – through the light and towards Fiesta Island – this is now East Mission Bay Drive. Get on a sidewalk if you can. 6. Go north on bike path. Pass by the dirt parking lot at the entrance to Fiesta Island (this lot is an alternative parking area in case you are not coming from OB), and continue north on the bike and pedestrian path that is on the west side of East Mission Bay Drive. Get off the streets and from here you’re on bike paths – except for one stretch in the northeast section of the bay, near Crown Point. Biking around Fiesta Island adds about 3 miles to the trip. A typical view of the bike/ ped bath along East Mission Bay. 7. Continue north on the bike path, past Tecolote Creek, past the Hilton Hotel, up to DeAnza Bay in the northeast clover quadrant. 8. Turn west – staying on the same bike path – at the fitness course. 9. Turn right (north) on DeAnza Rd at the small round-about at the end of the bike path. 10. Turn left on North Mission Bay Dr. and go west. This is a brief section of street but with very little traffic. Looking south towards the bay from the Mike Gotch Memorial Bridge. 11. Cross the Mike Gotch Memorial Bridge and continue west on the brand new path, past the playing fields of Mission Bay High School. This bridge was just dedicated one year ago. Gotch was a former city councilmember representing Mission Beach. 12. 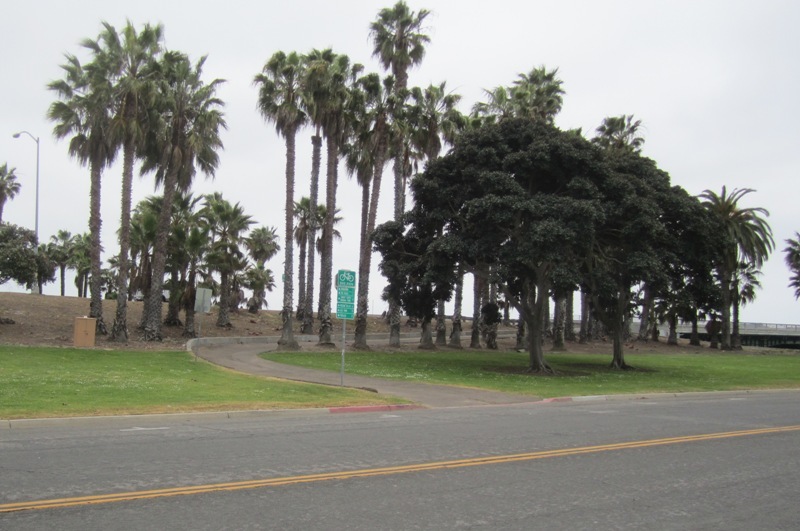 Stay on Pacific Beach Drive – as the Bridge path turns into this roadway. This is another stretch where you’re on the street; bike past Campland on your left and peddle the short distance to the intersection with Olney Street, stop and keep going straight up a slight incline. 13. Continue on PB Drive going west, past the Kendall-Frost Preserve, its trailer off to your left. 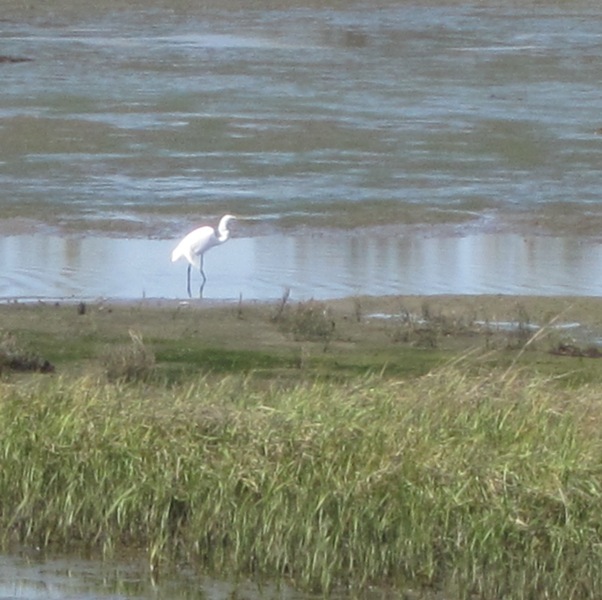 Stop and check out the photos of the wildlife that lives and stays in the bay. 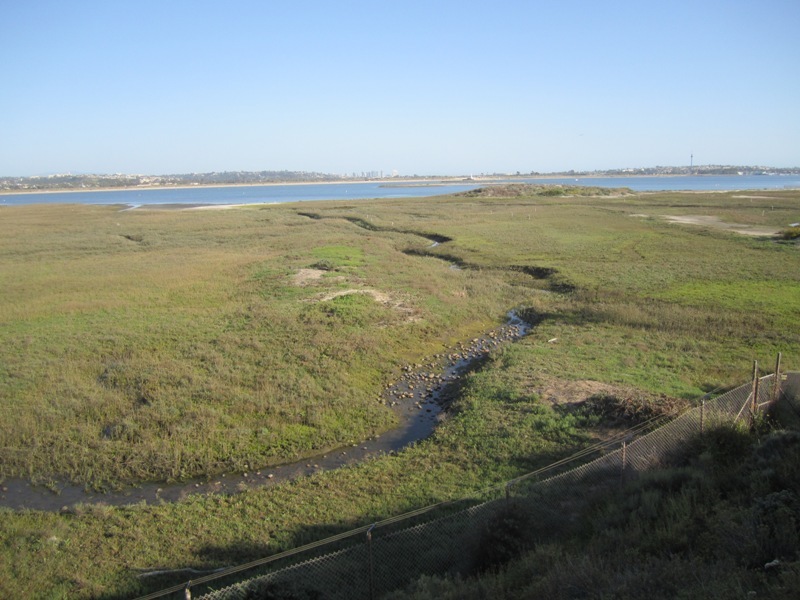 The last “natural” area of Mission Bay, near the east side of Crown Point in PB. 14. Turn left at Crown Point Drive. 15. Stay on Crown Point Dr until the entrance to Crown Point Park becomes visible, bear left. 16. Go left down the hill to the park, and then left into the parking lot, staying on the left edge of the lot – and you’ll then see the entrance to the bike path through the park. 17. Get on the bike path and go south through Crown Point Park. You’re now officially on the Bay Side Walk and you’re going to stay on it around Crown Point, under the Ingraham Street bridge, and over to northwest Mission Bay. The Bayside Walk in Crown Point Park, heading westernly. 18. Bike under Ingraham Street bridge and onto the west side of Crown Point, as you bend north once again. 19. Go north on Bay Side Walk to Fanuel Street Park, a small rest area and take a break; there’s restrooms, shade, parking, a kiddy playlot and plenty of grass. 20. Travel west on the Bayside Walk, over a low ped bridge and through the Catamaran’s expansive claim to the beach and shore. The path on the other side of Crown Point, heading north towards the northwest sector of the bay. 22. Continue south, past Santa Clara Point, past El Carmel Point and past the sleeping Bahia Bells off to your left, nestled at the Bahia Hotel docks. Condos and apartments along Bayside Walk in NW Mission Bay. These buildings were grand-parented in and were able to avoid the restrictions of the 30 foot height limit. 23. 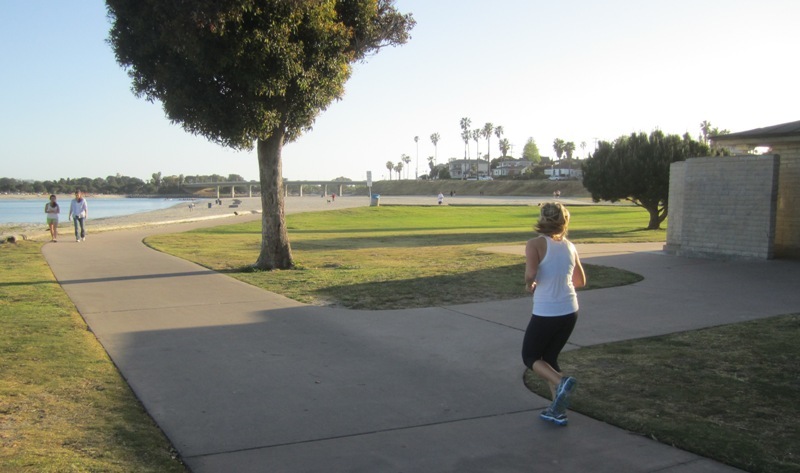 Get on sidewalk and go east and parallel with West Mission Bay Drive, carefully crossing the busy roadway. 24. Go over the Glen Rick Bridge, heading east on W. Mission Bay Dr.
25. Take right to Quivira Road. Coming down the bridge, take a quick right at the light, across from the Dana Hotel, and then a quick left onto Quivira Road, going east away from Mission Beach. You’re on street surface once again – the last street section of the route. The path from Quivira Roadway to the bridge to Ocean Beach. 26. Follow Quivira Road eastward as it curves around and passes the Marina Village area with its large parking lot. Watch out because parts of the asphalt along outside the parking lot are very rough. 27. Turn left and go up the bike path to the bridge to Ocean Beach. Crossing the San Diego River, heading back to Robb Field. 28. Cross the San Diego River for the last time as you glide back to Robb Field and the starting point. Total distance: 12.71 miles. Congratulations – you’ve made it! Note: I will be publishing a longer version with many, many more photos and descriptions. Watch for it. I ride Gitmo Dave’s “Cheney/Rummy/Blair bike down Andrew Deans Parkway, then over to that area all the time. It is a super fun ride. Where Dave is Andrew Deans Parkway? That asphalt along the river from Dog Beach, it runs all the way to Hotel Circle where my friend Andrew works. Fantastic! Great photos and I enjoyed the anecdotes along the route. I haven’t done this full loop before – will have to check it out. Your note on the winds along the river are right on – can be pretty strong heading west for sure. I used to do this ride all the time years ago…and I think I’ve got the family convinced to start hitting it up again thanks to this article – thanks Frank! 1. I cross the bridge headed north on the east side of Sunset Cliffs and take Old Sea World Drive east (pretty much a bike path) on the north side of the river (away from the freeway), then cross Sea World Drive at Mission Bay Parkway (protected crossing) and double back a quarter mile or so to hit the beginning of the bike/pedestrian path around the bay at South Shores Park, thus avoiding virtually all heavy car traffic. 2. I stop in Mission Beach for a burger or tacos and beer before heading home. I know that “deviation” very well. That ride takes you over the old industrial dump buried next to SeaWorld at South Shores Park. There are plenty of alternate routes and I really didn’t get into them, wishing to complete the main one. I hope to update this some day with those other ways and to complete the “long version” – have you seen it? By stopping in MB and chowing down you kind of undo what you just did, don’t ya? The other thing, Dave, about that deviation is that you then miss going over the San Diego River and the views that you can take in. The traffic on the Pac Hwy bridge is fairly light, and except for the bridge over the freeway that one has to take, it’s a breeze. 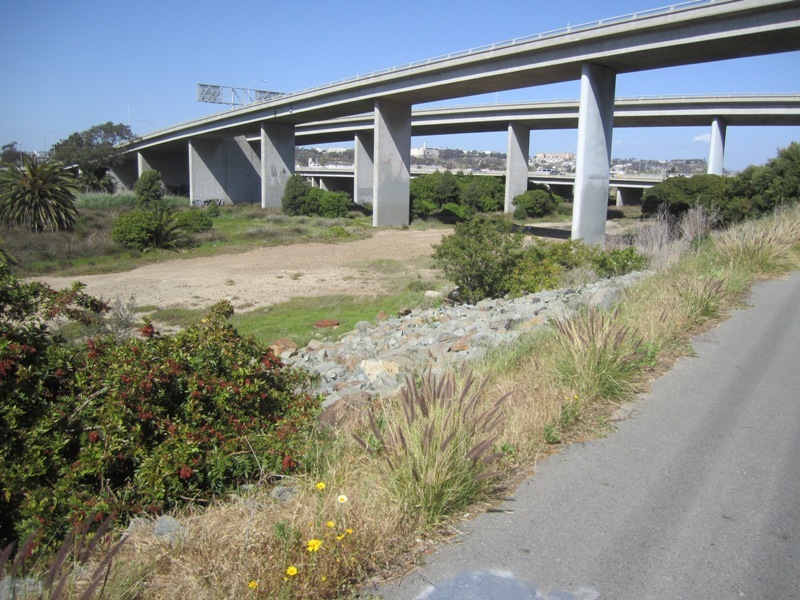 I guess I got used to the south side of the SD River because of its access to other routes – like the one up Mission Valley to the Mission de la Acala. It’s a trade off. I’ve hit the south side up heading into Old Town before, and a lot of times I’d ride out and back along the river, stopping around the 5, just for the sake of a ride. Really the freeway doesn’t bother me that much, I’d just pop an earbud in to the side facing traffic to listen to some music while keeping the other ear open. Will have to try your way and head north sometime for the river views, though. LOL – I do it only for the exercise and for my heart and lungs and brain and spirit. I want to show you my long ride out to the Mission and back – roundtrip of 18 miles from the skateboard park. That’s my preferred route as well. You can really pump along old Mission Bay Drive, Thanks Frank, you motivated me to take this ride and now do it a couple times a month. An important part of my life! What a great story and I love the pictures! I did part of this ride a couple of years ago when I came back to my old digs for a visit. My sister and I brought bikes from east county where she still lives, and we road around, without crashing, stopped for Ice Cream :) Living in New York now I do miss San Diego. I guess that’s why I like to travel so much in search of good beaches! Give us a call next time you’re in San Diego. I have never made this ride without a stop at Cass Street Bar and Grill….so I don’t know the time for this trip. My guess is three hours and three beers. 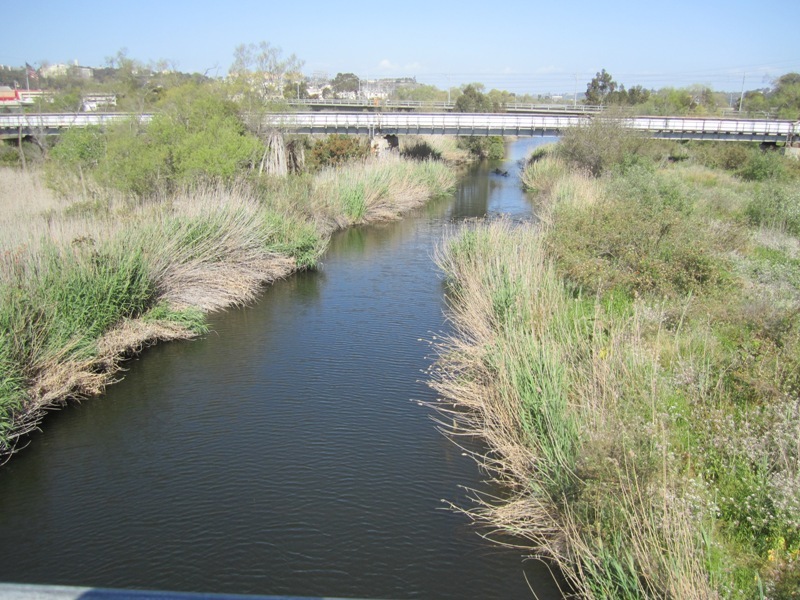 Nice article, a good resource- though I have to chuckle at that “the GREAT San Diego River” embellishment, or at least give you credit for coining the phrase. Never heard that before and if that little storm runoff creek is “great” then I’m a monkey’s uncle. The Mississippi is great. The Colorado as well. Any of the three forks of the Stanislaus river where I grew up in NorCal could even claim that. It’s kind of like calling that Cleveland thingy a National Forest. Only if you’ve never seen a real forest. That’s it ! you did it Frank , you pushed me over the edge ! I fixing my bike today. Biking saved me too, as a form of exercise. After my knee went out and I could no longer do hikes, it’s the bike for me. My husband and I did this ride last week, he on a 15 speed and me on a beach cruiser. It was a very nice ride and we both enjoyed it , saw a lot of SD that I usually only see from a kayak, a car, or not at all. Thanks for sharing, I’ll be doing that’s ride again tomorrow! Lily, thanks, yes, it’s a great ride. Very little hills is what I like about it. Did you stop on the Mike Gotch bridge? Yes Frank, we did! I love that bridge but I’m usually underneath it…I kayak a 12 mile Mission Bay circuit that always includes that little canal that goes under the bridge, both perspectives are peaceful and beautiful. I’m working on building up to longer rides for stamina and fitness, I have problems with my feet so I took up kayaking last year and biking this year. I love seeing all the beautiful views from a different vantage point. I started riding a couple weeks ago and have already lost some weight too and that’s a huge plus. So I swim the bay, kayak and now bike it, we live in the perfect place for all of those! Hey, I found some weight; do you want it back? Ive done this ride! I usually stop & have lunch at the new Swell Cafe on the blvd. They have great coffee & sandwiches. The stopping and undoing I usually save for OB. I include it as motivation! I’ll try this out again, I didn’t think to fit the river bike route in. 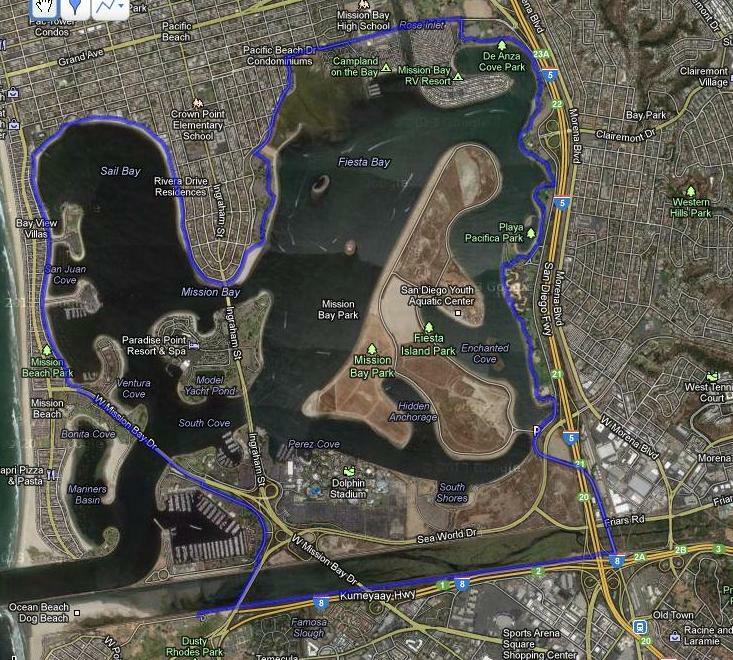 And to add some length, you can do a lap around Fiesta Island.